This is the final installment of the 4-part patent landscape analysis for cell-based meat. I’ll discuss Integriculture’s patent, describe two extra patent applications that don’t belong to any cell-based meat company, and provide some analysis on the entire landscape. Integriculture is the for-profit arm of the Shojin Meat Project. They are based out of Japan and recently raised a $2.7 million seed round . This patent  describes “Culnet” —a bioreactor system designed to lower the cost of media by using feeder cells . 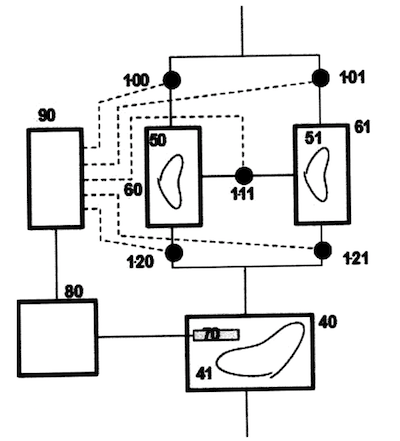 In a Culnet system, a central tank containing muscle cells is connected to one or more peripheral tanks containing feeder cells like liver and placental cells. The feeder cells secrete growth factors which are circulated through the system by a central controller. This mimics natural processes in the body, where organs secrete growth factors which are circulated to other tissues via the bloodstream. There are a number of possible arrangements for the tanks, determined by how the media is flowing through the system. In the “series” arrangement, each tank receives media from a maximum of one other tank. For example, in a system with three tanks, media from the third tank must flow through the second tank to get to the main tank. The series arrangement is advantageous if growth factors from one type of feeder cell can help another type of feeder cell to grow. In the “parallel” arrangement, each feeder tank feeds only the main tank. Finally, in the “reflux” arrangement, media from the main tank flows back into the feeder cell tanks. This is useful if media from the first tank can be recycled, or if secreted growth factors from the main tank can in turn feed the feeder cells. Figure 6 from the patent application: Schematic representation of an implementation of the Culnet system. Muscle is cultured in tank 40, and placetal and liver feeder cells are in tanks 60 and 61. The controller 90 can open or close valves 100–121. If only valves 100, 111, and 121 are open, the system is in a series arrangement. If all valves are open except for 111, the system is in a parallel arrangement. A central digital controller controls the flow of the media by opening and closing valves in between tanks. At different stages of a single culture, the flow of media can shift so that the tanks are in a new arrangement. For example, at the first stage of growth, the controller might direct media in a series arrangement, then in the next stage the controller might direct the media in a parallel arrangement. The main culture tank, which usually contains muscle, has sensors that can infer the state of the culture. The sensors might measure metabolite levels, or monitor protein concentrations using enzyme-linked immunosorbent assay (ELISA) or photospectrometry. The system can optionally include media recycling. Used media is pumped through a closed circuit with a gas exchange unit that removes CO2 and adds oxygen, and a dialyzer that removes toxic metabolites. This lowers the total amount of media needed, and prevents the flow of toxic metabolites from feeder cell tanks into the primary culture tank. Along similar lines, the patent suggests using a filter between tanks to remove unwanted matter like air bubbles and sediment. In one example that the patent discusses, mouse placental and liver cells are used as feeder cells to grow mouse myoblast cells. At the start of the culture, three thanks are in a series arrangement with placental cells feeding the liver cells, and liver cells feeding the muscle cells. Hepatocyte Growth Factor (HGF) proteins secreted by the placental cells act on the liver cells, and other growth factors secreted by liver cells act on the myocytes. When the sensors in the primary culture tank detect a high enough level of HGF, flow from the placental cell chamber is cut off. Then, when a threshold amount of liver growth factors is detected, flow from the liver cell chamber is also cut off. The myocytes continue to grow until they terminally differentiate. One advantage of using feeder cells is that secreted growth factors don’t have to be purified from another culture. Media from the feeder tanks flows directly into the main tank. Since purification can be a major cost of recombinant protein production, the Culnet system may have a lower media cost compared to other systems. Computer rendering of the culnet system in reflux arrangement from Integriculture’s pitch deck. [A] and [B] are feeder cells. Media from multiple myocyte tanks is recycled using dialysis, oxygenation, etc. A second advantage is that feeder cells lessen the need to understand the exact mechanisms controlling cell behavior. If Integriculture were designing a completely defined media, they would have to know exactly which proteins they needed, and in what quantities. With feeder cells, they can treat the system more like a black box, since they know empirically that the feeder cells will secrete growth factors that cause the muscle to grow. An advantage of the Culnet system over other feeder cell systems is that the controller can shift the arrangement of the tanks as the culture progresses. Oftentimes, feeder cells are cultured in the same chamber as the target cells, limiting which growth factors the target cells are exposed to. With the Culnet system, different arrangements of feeder cells can be used at different stages of the culture. A final advantage of the Culnet system is that liver and placental cells could be turned into food and sold as byproducts. Integriculture doesn’t mention this in the patent, but it seems like way to recoup part of the production cost. a controller that controls the flow of media throughout the system. There are a few patent applications that weren’t filed by cell-based meat companies. This patent application describes a manufacturing method for cell-based meat optimized for integration with a production line. First, cells are seeded onto a porous sheet made from a material like plastic. The cells form a .5mm layer, thin enough to not need vascularization. The sheet is rolled through a bioreactor which perfuses media through the layer, allowing the cells to proliferate and differentiate into muscle. The substrate can stretch and contract to mechanically stimulate the cells. After the cells have fully grown, the sheet is rolled to a separate area where the cells are flavored, processed, and packaged into a finished meat product. Figure 4 from the patent application. 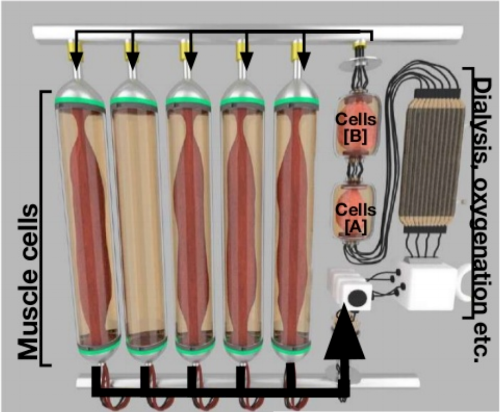 Schematic where a porous sheet of cells is fed through a perfusion bioreactor. The major advantage of this system is that the bioreactor connects directly to the production line, making manufacturing simpler and more automatable. However, since the layers of cells are so thin, it’s unclear whether this system would produce enough meat to be cost effective. This patent is owned by a firm called Empire Technology Development LLC. There is little public information about the firm other than the fact that they own 7,200 patent applications in many different areas. This suggests they may be a patent troll . In 2009, they filed an early version of this patent, but later abandoned it. Then, in 2017, they filed a continuation application, likely because of the increased hype around cell-based meat. If the patent is granted, it could be used to harass legitimate cell-based meat companies. the layer of meat is passed through stations where it is flavored, processed and packaged. The progression of the cells through the system must also be controlled by a computer. This patent application  attempts to protect any food or drink product made from cultivating primary tissue isolated from an animal. It seems unlikely that using primary tissues over cell lines will ever be scalable. Since the patent application provides very little detail on how the process will work, it’s likely that cell-based meat companies can ignore it. The companies with public IP around cell-based meat are Memphis Meats, Just, Future Meat, Modern Meadow, and Integriculture. Of those, only Just, Modern Meadow, and Integriculture have patents that are granted. Currently, Integriculture’s patent is only enforceable in Japan, and Modern Meadow’s patents are only enforceable in the US. Just’s patent Method for Producing Tissue Engineered Meat for Consumption is only enforceable in the US, and their patent Industrial Production of Meat is enforceable in both the US and Germany. All of these patents were filed through the Patent Cooperation Treaty, meaning that they could be also be enforceable in other countries in the future. Broadly speaking, patents can be divided into engineering patents and biology patents. Modern Meadow’s bioprinting patents, Integriculture’s Culnet patent, and the closed-perfusion bioreactor described in Future Meat’s patent application fall on the engineering side. Memphis Meat’s two patent applications, and the small-molecule work in Future Meat’s patent application fall on the biology side. Just is an outlier, with two broad patents on the entire cell-based meat process. Where are all the patents? It may seem odd that many of the funded cell-based meat companies don’t currently have any public intellectual property. However, it’s important to remember that intellectual property is often inaccessible to the public, and that cell-based meat is still very young. Public funding of cell-based meat companies over time. Credit to Elliot Swartz at The Good Food Institute. There are 18 months between when a patent application is filed and when it becomes publicly available. This means that the current patent landscape is merely a snapshot as of early of 2017. A couple companies have discussed patents applications they have filed that are not yet public, e.g. Mosa Meats  the Israeli company Biofood System  and Meatables . The provided chart of cell-based meat funding shows that activity in the space has quickly increased in the last two years, meaning there are likely even more patents applications that we don’t have access to. There could also be important technology in provisional patent applications. Provisional patent applications are an easy way for a company to claim an idea before validating it. They are cheap to file, but they are not reviewed by the USPTO. The company has 12 months to validate the idea and file a normal patent application, which uses the priority date of the provisional application. During these 12 months, the provisional application is not published. Finally, there could be important technology that companies are keeping as trade secrets. This would be atypical since patents are often major assets in biotech. However, trade secrets might be appealing if a company wants protection for longer than the 20 years that a patent provides. It can be easy to forget how young the cell-based meat industry is given the amount of attention and hype it receives. As an illustration, Impossible Foods has raised almost $400 million , while the entire cell-based meat industry has raised less than $100 million. Impossible Foods has also been doing R&D since 2011, many years before the cell-based meat industry began receiving significant funding. It shouldn’t then be surprising that Impossible Foods also has more public patents than the entire cell-based meat industry. We can also look at the larger cultured materials companies like Spiber, Bolt Threads, and Modern Meadow as indicators of what cell-based meat companies might look like in the future when they’ve had more time and funding. These companies each file multiple patent applications a year . As cell-based meat companies mature, we will likely see significantly more patenting. Who has the most useful patents? At this point, it is difficult to say whose patents will prove to be the most useful since relatively little is know about what cell-based meat production will look like at scale. Even if a company’s portfolio seems promising right now, pending patents could be abandoned if they are too broad, and granted patents could be invalidated in court. That being said, the most pressing challenge right now is bringing down the cost of culturing cells at a large scale, and patents that directly address this seem like they will be the most useful. Future Meat’s patent presents a clear path to lowering cost by culturing fibroblasts in small bioreactors, and using small molecules to induce differentiation. If Future Meat can validate their cost model, they will justify their contrarian strategy and be in a strong position. Integriculture’s patent could also lower costs by reducing the need for recombinant growth factors. Memphis Meats’ patents, if granted, could help lower production costs for GMO meat. In contrast, Modern Meadow’s bioprinting patents don’t directly suggest any way of lowering the cost of culturing cells. The patents might prove useful when the industry is exploring 3D slabs of meat, but in the short term they don’t address the most pressing problems. Just’s patents are the broadest, and therefore the most potentially powerful. They cover the entire process of cell-based meat production, and have already been granted. They could put Just in a very strong position depending on how aggressive Just is in defending their patents, whether the patents expire before it makes sense to defend them, and whether they prove to be valid if challenged. My goal with this series was to give readers a sense of the technology that cell-based meat companies are developing. I hope people have found it useful. I’ll continue to review and analyze patent applications as they are released. Thank you to Alene Anello, Nicholas Legendre, A. Sasha Mandy, Elliot Swartz, Rom Kshuk, Sara Oliveira, and Ajeeth Adhikari for editing drafts, and providing expertise on all 4 parts of this series! Google Patents currently has a poor English translation of this patent. Here is a translation that uses the most up-to-date Google translation model. Feeder cells are cells whose secretions help other cells grow. They are commonly used in stem cell culture. For an overview, see https://www.ncbi.nlm.nih.gov/pubmed/25659081.